Tries to Cut Services to jews! The United Nations Human Rights Council is pressuring a major Israeli telecommunications company to cease operations in disputed areas of the Jewish state or face a potential designation as a human rights abuser, according to a copy of communications sent by the Human Rights Council that is being viewed as an attempt to blackmail international corporations into boycotting the Jewish state. The UNHRC recently sent a letter to the CEO of Bezeq, a major Israeli telecoms firm, accusing it of promoting settlement activity in Israel and of providing cellular services to areas that the Council believes are Palestinian territory. The UNHRC's effort to create a database of companies working in and with Israel is being viewed by pro-Israel leaders as an effort to intimidate Israeli and Western businesses as part of the Boycott, Divestment, and Sanctions movement, or BDS, a global effort that has been described by the United States and others as anti-Semitic in nature. 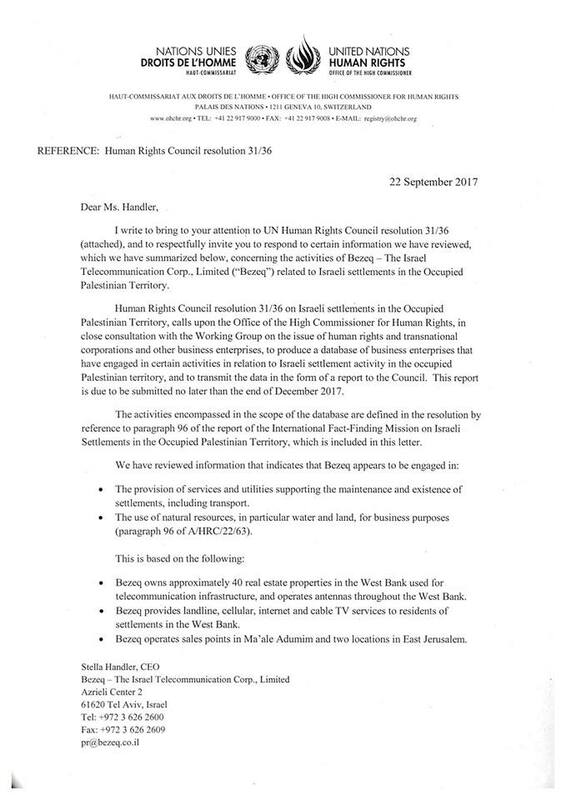 Bezeq is among a number of companies, including those in America, who have received such letters from the UNHRC. A senior U.S. official familiar with the situation said the Trump administration opposes the UNHRC database and views it as part of a larger effort to isolate the Jewish state and use the United Nations to bully international corporations. The UNHRC has long been accused of harboring an anti-Israel bias and recently elected a number of prominent global human rights abusers to take a seat at the council, including nations such as the Democratic Republic of Congo, Afghanistan, Angola, and Qatar, all of which have been accused of violating their citizens' human rights. The UNHRC's effort to create a database of corporations that it claims support Israeli settlement growth and the abuse of Palestinian human rights has been described by some pro-Israel voices as a blackmail effort meant to undermine the Jewish state's international standing. The UNHRC sent a letter to Bezeq in late September accusing it of "supporting the maintenance and existence of settlements, as well as the "use of nature resources, in particular water and land, for business purposes," according to a copy of that letter that first circulated on Facebook. "Bezeq owns approximately 40 real estate properties in the West Bank used for telecommunications infrastructure, and operates antennas throughout the West Bank," the UNHRC wrote in its letter." "Bezeq provides landline, cellular, internet, and cable TV services to residents of settlements in the West Bank," according to the UNHRC, which considers this activity a violation of its accords. A spokesperson for the U.S. Mission to the UN criticized the creation of the database, telling the Washington Free Beacon the United States will not participate in such an effort. "We have made clear our opposition regarding the creation of a database of businesses operating in Israeli settlements in the occupied territories, and we have not participated and will not participate in its creation or contribute to its content," the official said. Anne Bayefsky, a prominent pro-Israel activist and head of Human Rights Voices, a watchdog group that monitors anti-Israel bias at the UN, told the Free Beacon the letter to Bezeq represents an effort by the international body to promote BDS efforts against Israel. 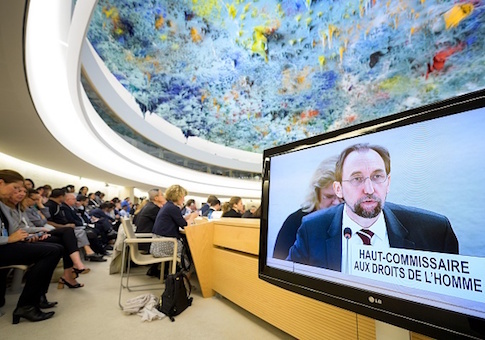 "The UN High Commissioner for Human Rights, Jordanian Prince Zeid Al Hussein, acting in cahoots with the UN Human Rights Council, has been blackmailing companies around the world as part of a UN BDS campaign directed at Israel," Bayefsky said. Similar letters have been sent to companies across the globe, threatening them with inclusion into this anti-Israel database. "Until now, the UN High Commissioners Office has been sending around secret letters both to companies and to states, threatening them with inclusion in a database of offenders that the UN plans to release by the end of the year," Bayefsky said. "The database is to include companies that ‘directly or indirectly' are connected to Israeli settlements. It is nothing short of an assault on the economic welfare of the state of Israel, period." 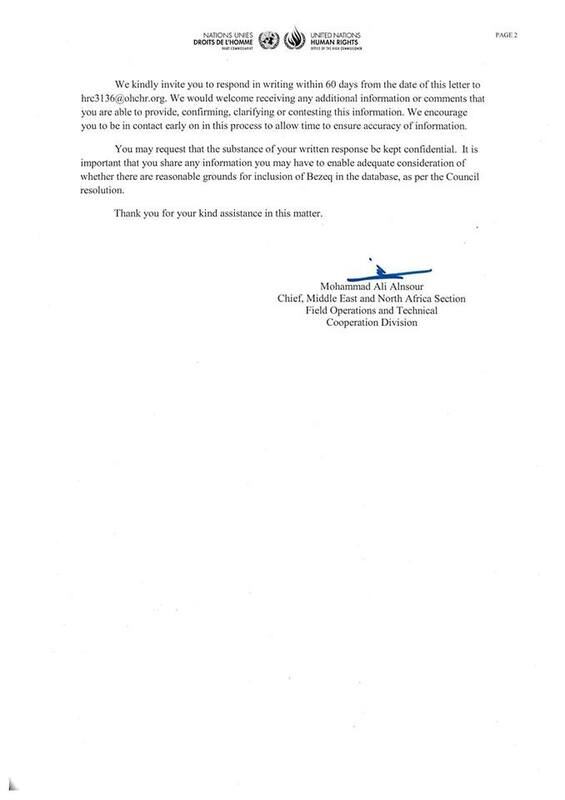 As many as 30 American companies are believed to have received similar letters, according to Bayefsky, who urged the Trump administration to take greater action to counter the campaign. "American shareholders and businesses, and the communities that depend on them, have no idea whether the State Department has been in touch with these companies and given them immediate and appropriate advice about how to handle this dangerous UN affront," Bayefsky said. "The fact is that the high commissioner and the Council have no legal basis whatsoever in writing these letters or demanding any response to the Council's anti-Israel resolutions that in turn have no legal status. Moreover, American companies that write back to the high commissioner may well violate American law, especially given numerous states that have adopted anti-BDS legislation." "The silence from American officials has been deafening and totally inexcusable," Bayefsky said. "Blackmail is not defeated by playing by the blackmailers rules." Representatives from Bezeq and the UNHRC did not immediately respond to Free Beacon requests for comment on the matter.